Almost on a daily basis, more information comes out from credible sources including Ron Paul, Boston University Economics Professor Laurence Kotlikoff, and the Congressional Budget Office that the United States is in a severe financial crisis, and the main cause of this crisis is the country’s debt load, which is the foundation of the financial conspiracy in The Brink. I went back and re-read David Meerman Scott’s The New Rules of Marketing and PR last week and was reminded that, for authors anyway, there is simply no better bang-for-the-buck promotional piece than the news release. My schedule of signings and appearances has ramped up lately, so I’ve got more news to release. If you live in the Dallas/Fort Worth area, please visit http://markfadden.com/appearancesandpress.html for a schedule of upcoming events. Remember fellow writers, you can write your own news releases (you’re writers after all, right?) and you can post them in blogs, on websites, on your Facebook, Twitter, Shelfari, and Good Reads pages. You can also email them to the local newspapers to see if they’ll give you some ink. In the case of doing a signing or an appearance in a local store or local library, those are great stories, and exactly the kind most community papers are looking for. If you’ve written a professional news release and included a high-quality pic (or several for them to choose from) then you’ve saved the reporter a couple hours work, something that is always appreciated in a business where deadlines are cast in stone. Want to start reading The Brink right now? Download the eBook version from amazon.com at http://www.amazon.com/The-Brink-ebook/dp/B003OYIEPC/ref=sr_1_2?ie=UTF8&m=AG56TWVU5XWC2&s=digital-text&qid=1284567122&sr=8-2 or bn.com at http://search.barnesandnoble.com/The-Brink/Mark-Fadden/e/9781450210492/?itm=1&USRI=mark+fadden. So what does it take for a virtually unknown author to sell books? Get a front row seat as Mark Fadden blogs about his marketing hits and many misses on the way to sell 5,000 copies of his latest thriller, The Brink, in one year. Could a novel come true? A fugitive lawman uncovers the link between a secret society’s plot for financial Armageddon & the FED, based on REAL economic numbers. I think folks from as far away as Russia (oh yes, according to my godaddy.com site analytics, I’m huge there) could probably smell the stench of failure on this ad. But, it’s staying up until the end of the week, because I said I would keep it going that long, and by Neptune’s trident I am a man of my word! Tired of the same plots & the same characters? Read the intro to this award winning thriller and never see the world the same again. 51 total in two days with 15 new today. The CTR % (click through rate) dropped off, but that’s to be expected since the same group (people who like books) are seeing it over and over (by the way, there are 560,900 people in that group). I asked the question last night how I can leverage the seeming popularity of this ad. I didn’t have a chance to give it much thought today, but it’s still pinging around inside the old melon. I took the opportunity to look at my godaddy.com site analytics last night and saw something interesting. There was a steep drop in the number of visitors over the last few days. It started around the time I changed up the language on the site to reflect more of my personality, which sounded like fantastic advice coming from my social media Moses David Meerman Scott in his book The New Rules of Marketing and PR. So, to make the sight more fun, I sprinkled the site with what I thought were snarky, smart assed, and what I thought were funny comments here and there. But, when people are looking for at a thriller writer, they don’t want Flopso the Clown. Like I said in last night’s post, they are looking to you to solve their problem. They need a good book. They want a thriller to thrill them. They don’t want a thriller writer trying to be funny. My website is something that I, like many other people that use primarily websites to broadcast their information, continue to struggle with. There are in the neighborhood of 124 million sites on the Internet and literally billions of web pages. We want to stand out and we stand out by providing great content. But how? Therefore, as a last ditch effort to pump up my numbers, I am doing a 5 day Facebook ad campaign. Yesterday, my ad read “The Brink by Mark Fadden. Uncover the most staggering conspiracy of our time and discover an electrifying new voice in suspense fiction.” There was also a cover pic. I set my budget at $20 day and chose the Cost Per Click (CPC) option. I only pay when someone clicks on my ad. With that ad, I had 15 clicks out of 19,858 impressions, which translates into a Click through rate (CTR) of .08%. Time to change the ad! 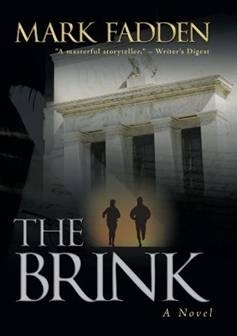 I changed it to read “The Brink by Mark Fadden. Uncover the most staggering conspiracy of our time. “A masterful storyteller” – Writer’s Digest and I selected people interested in ‘author James Patterson’ rather than ‘political thrillers.’ Hope my CTR will rise. Stay tuned. I checked in with my publisher, iUniverse, to see if there’s a way to see in real time if the ad led to more people buying the book online, but there’s no way to do that. In fact, I won’t know any sales #s until the end of July due to paperwork processing times. Holy $#(%$# *&#!!!! Okayed postcard invitation proofs (to be sent to Lewisville City Council) and picked up signing posters at my local FedEx Office. They’re fast, open late, and super nice staff. That place rocks! Contacted Lewisville Chamber of Commerce about putting news release in their weekly enewsletter. Contacted Lewisville book club members. 2 groups have Facebook pages! sent event info to Dallas Observer through their event posting site. sent Greater Lewisville Newcomers Club an email about the event. Why? I saw on their site that they sponsor a book club. Kenny Green, the Lewisville Borders Sales Manager, said the 40 books he ordered are already in, so I’ll see if I can drop by tomorrow with posters, flyers, bookmarks, and see if I can sign some books to maybe do a little pre-sales. Have you created your Google Profile yet? Get on it! The Brink is now out in eBook! Where oh where to market the eBooks??? So without little or no money, how do you get people to find you online? Participate in the discussion. The internet is all about content, and content doesn’t always have to be news releases and email marketing campaigns. Sometimes, you gotta just be there for other people. Once again, I turn to David Meerman Scott and his advice from The New Rules of Marketing and PR. From page 65, “One of the currencies of social media is that when you participate, people find out who you are. When you leave a comment on someone else’s blog post, you can link to your profile on the Web. All blogging tools have a place where you can leave a virtual calling card, your own web URL where people who read your comment can find out who you are and perhaps contact you.” He goes on to suggest that the best “virtual calling card” is to create a Google Profile and then use that as the URL for people to go to when you are commenting on other people’s blogs. Best of all, it’s free. I made the mistake, like many writers do, of going into sites like GoodReads.com and amazon’s book club sites and in the “looking for a great thriller” forum, just typing in “hey, if you want a great thriller, check out my new book, The Brink.” That’s like shouting what you do for a living at the top of your lungs at a cocktail party. Major faux pas. Anyway, now I know better. I’m going to start going onto other writer’s blogs this weekend and join the conversation with my Google profile as my URL. I just hope they like me….I mean, I really, really hope they like me! The Brink is now out in eBook for the Kindle and the Nook. While that’s awesome, how do we writers find people that actually have eReaders? I’ve yet to see them at my gym or on airplanes. After my current Facebook ad campaign is over (more on that in a minute) I’ll do one just for ebook readers and see how it goes. In the meantime, I went online and Googled in “ebook marketing” and the best hits I got were “start your home-based business making $300k a month by writing a real estate buying eBook” and “money-making super secrets” where you write an eBook to attract people to invest in your Nigerian black money-type scam. Oy vey! I just tried to set up a Facebook ad and when I used “eBook” as the criteria by which the ad will be sent out, there are only 620 people out of the 113 million above 18 years old on Facebook who are interested in eBooks. Rat farts! Back to the drawing board. Any suggestion from y’all would be awesome.